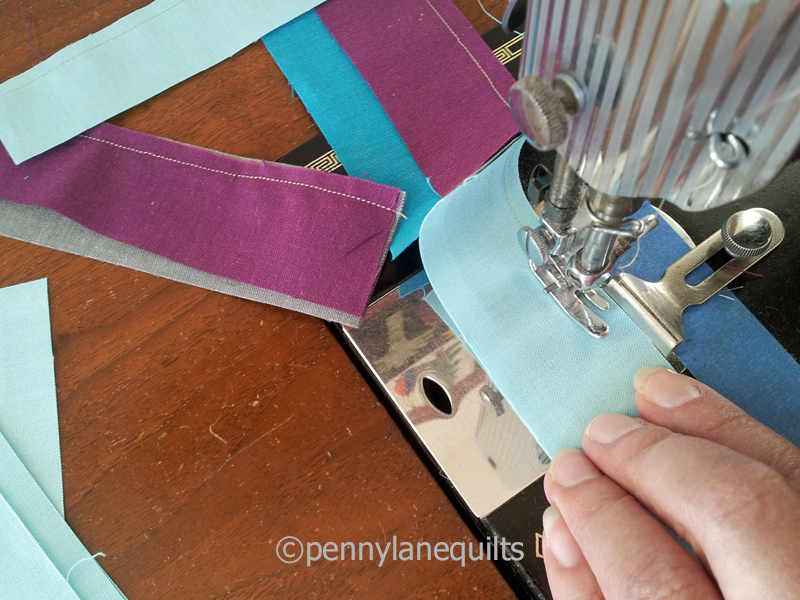 Welcome to the second day of the 2016 Cloud9 New Block Blog Hop! 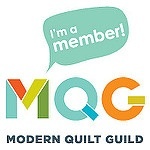 It is so exciting to be part of the block hop, sponsored by Cloud9, and hosted by Yvonne of Quilting Jetgirl, Cheryl of Meadow Mist Designs and Stephanie of Late Night Quilter! 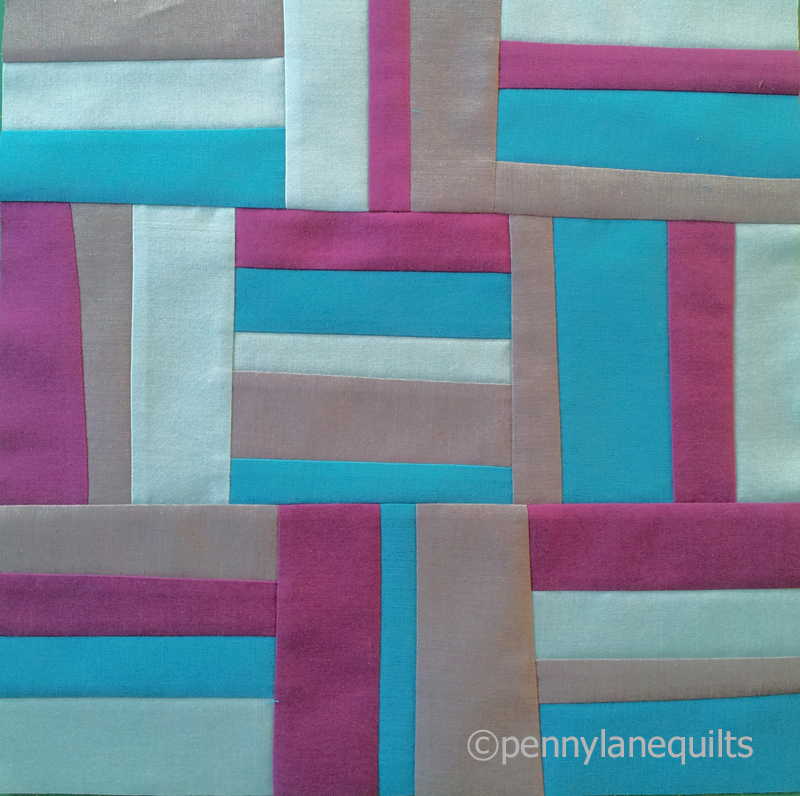 There are almost 70 bloggers designing blocks using the fat quarter bundle of lovely organic Cirrus Solids generously provided by Cloud9 fabrics. The hosts chose this palette for the hop, called “Berry Harvest”. I decided to use four of the colors, leaving “Lilac” out this time around. My block, Woven Berry Basket, is an improvisational block based on the traditional basket weave design. 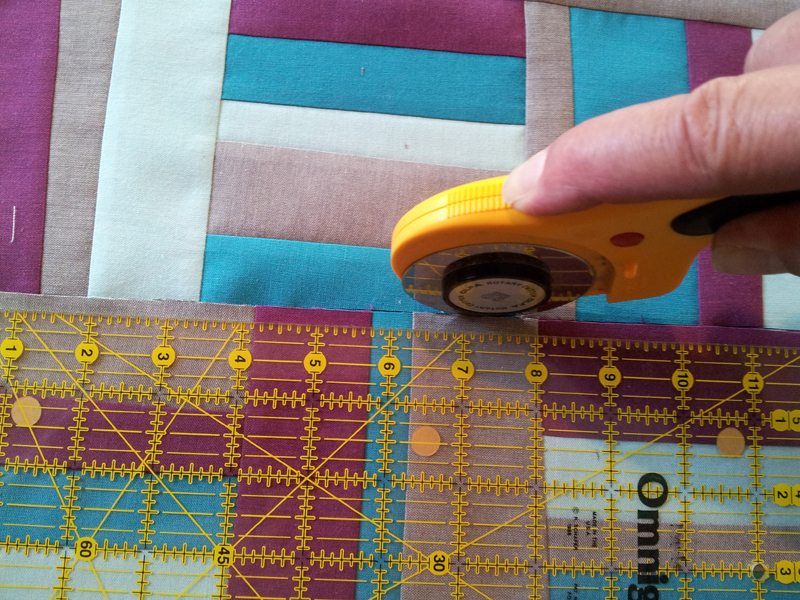 It uses a free form cutting technique (a.k.a cutting without a ruler). 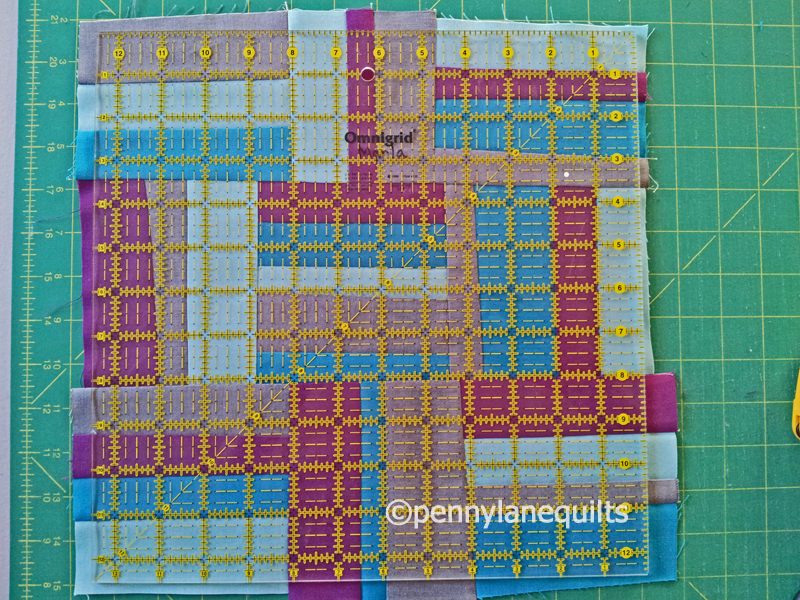 Your block will not be exactly like mine, but I will describe a process that you can use to make one that is similar in design. 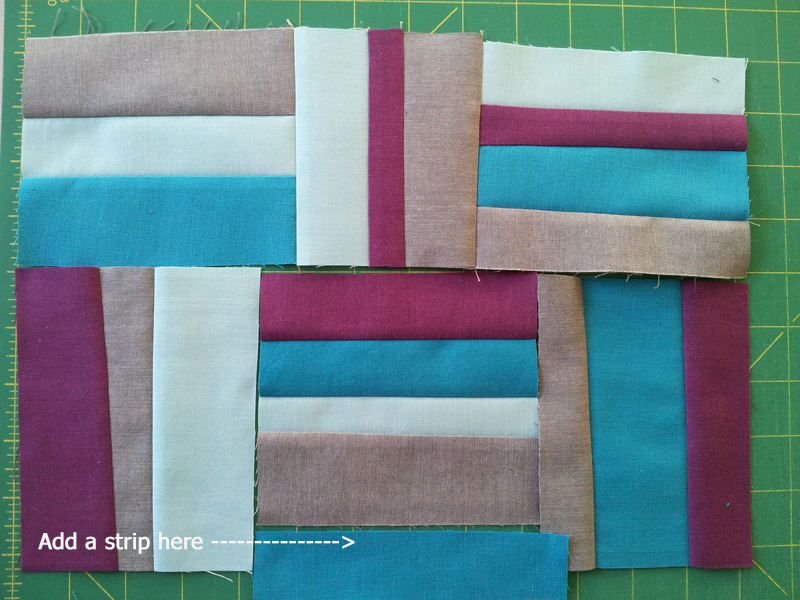 Cut 4 strips 5 in x 18 in (approx) Here’s your first chance to cut without the ruler! 3. Stitch 9 pairs of strips together, varying the colors and widths. 5. 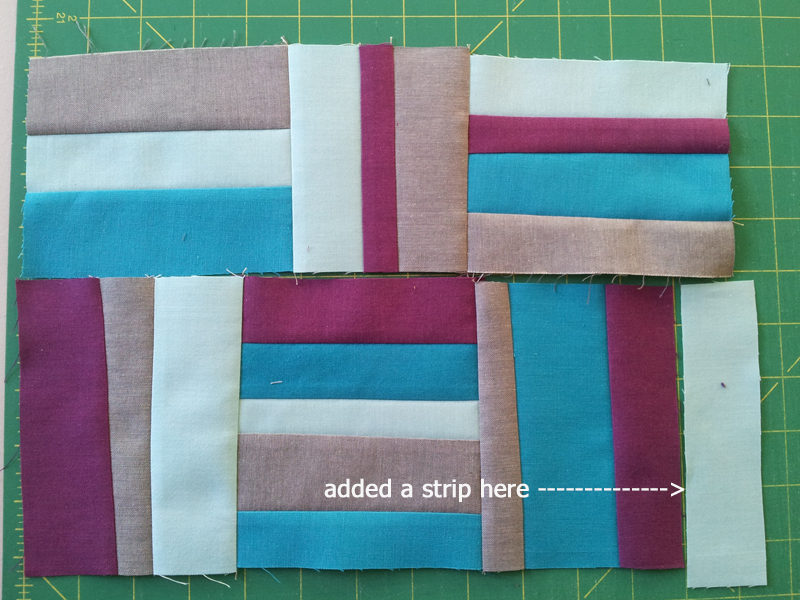 Add a third strip to each set, again varying the color placement and width of strips. 6. 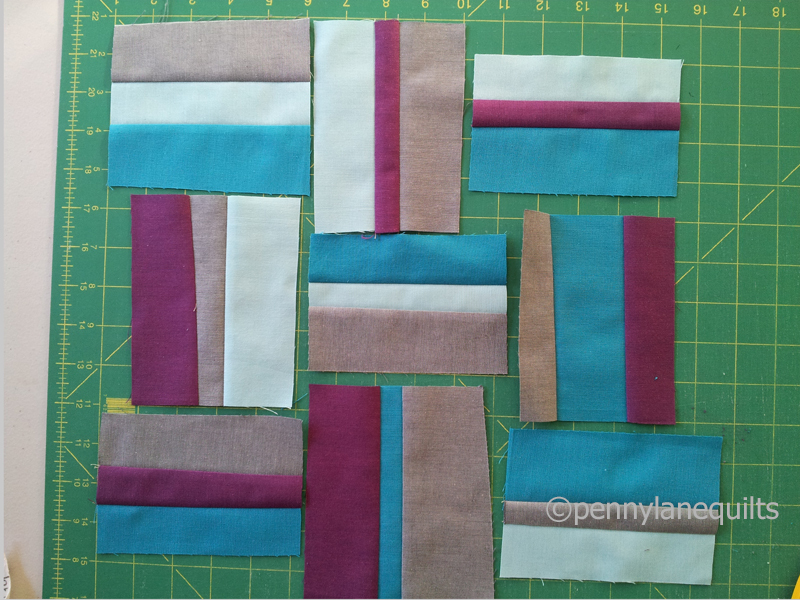 Lay out the 9 units in an alternating vertical, horizontal pattern. *At this point, you will need to start making decisions based on how your units are sized. I will attempt to describe how I solved the puzzle. For the first row, I decided to cut the bottom off the middle unit, and add a strip to the third unit. If it’s too long, cut it off and if it’s too short, add on! 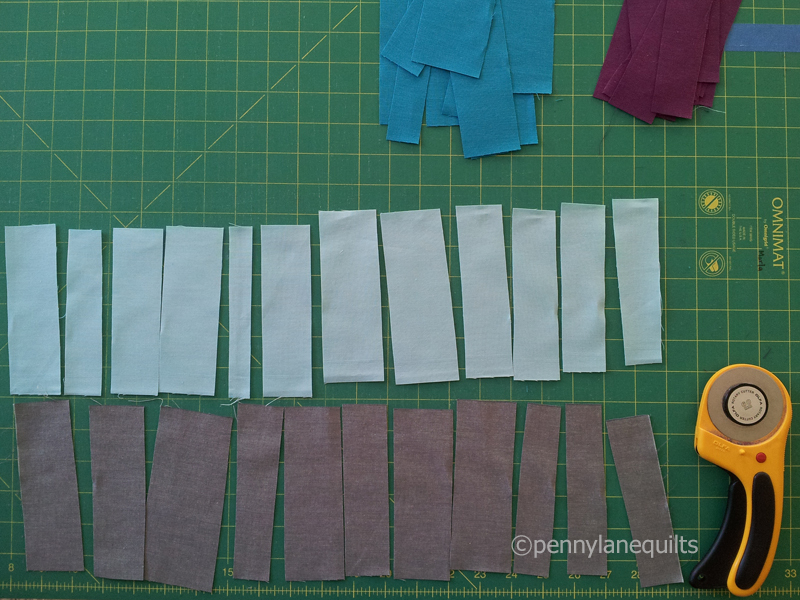 But when the units were assembled, the second row was shorter than the first, and I was aiming to have each row approx 13 in wide so that I would be able to trim it down to 12.5 in. What to do? Add on! To assemble the rows, I trimmed the top edge of the second row, then overlapped it onto the bottom of the first row (right sides facing up). 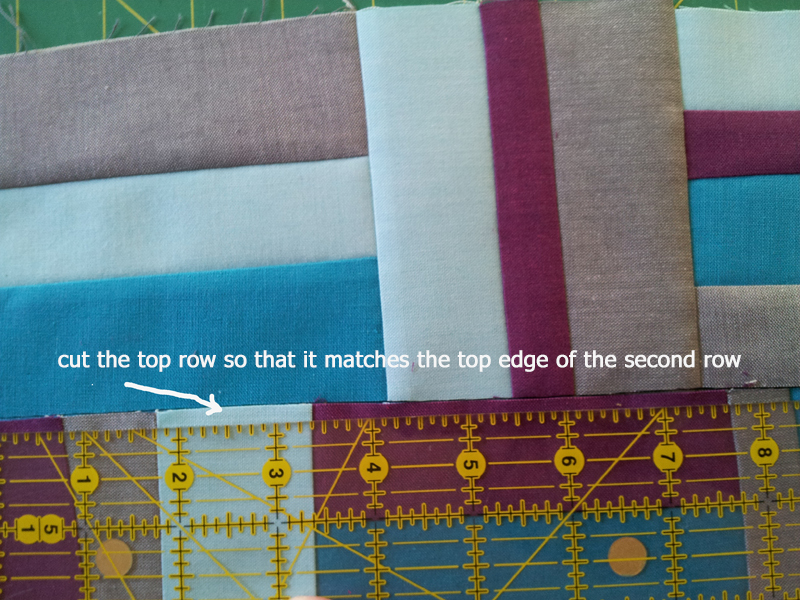 Using that cut edge as my guide, I trimmed the bottom of the top row to match. Follow the above procedures to assemble the third row and attach. 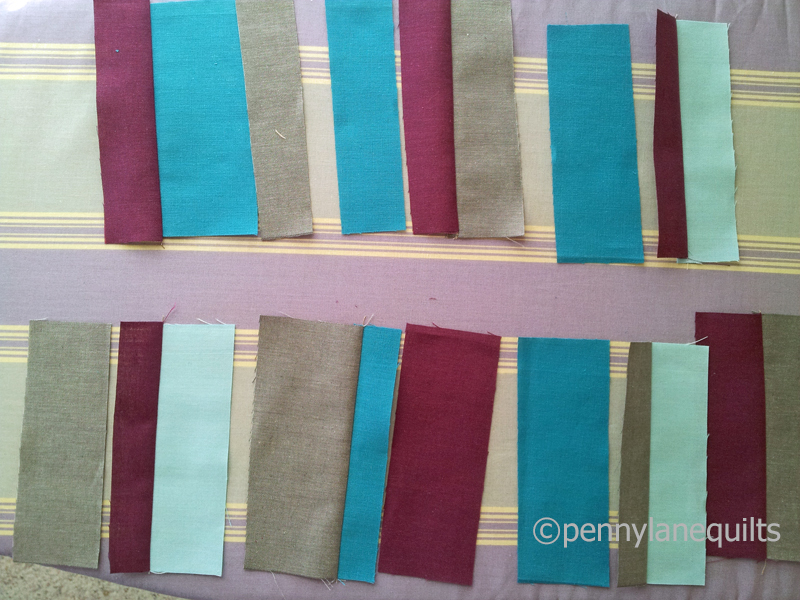 Can you see how I am cutting along the edge of the row, not along the ruler edge? 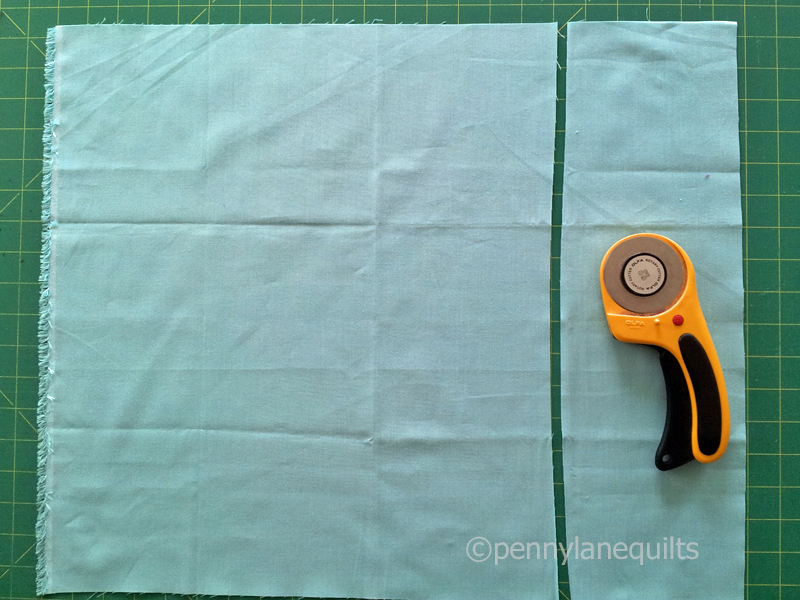 If your block is big enough, just trim to 12.5 in square and your block is complete. If it is too small, improvise! 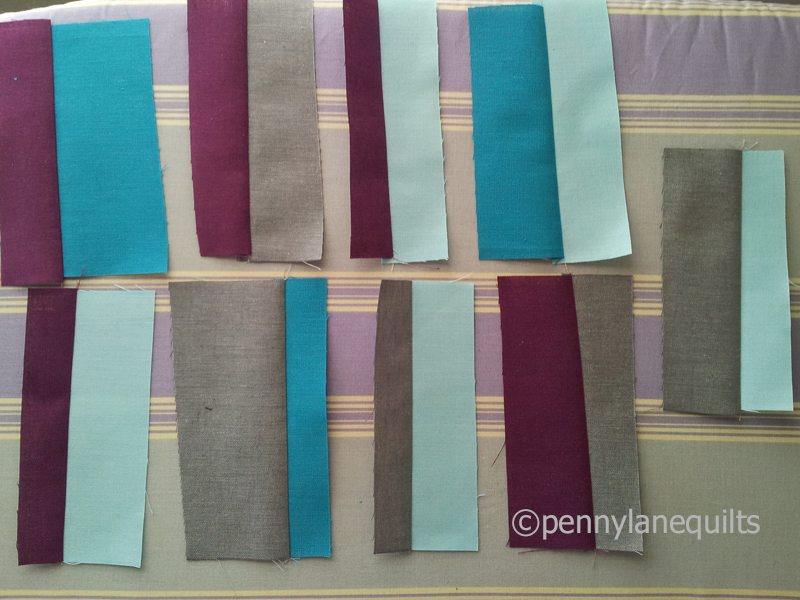 You might add some strips to form a frame, and then trim. Success! Trim to 12.5 inches and you’re finished. 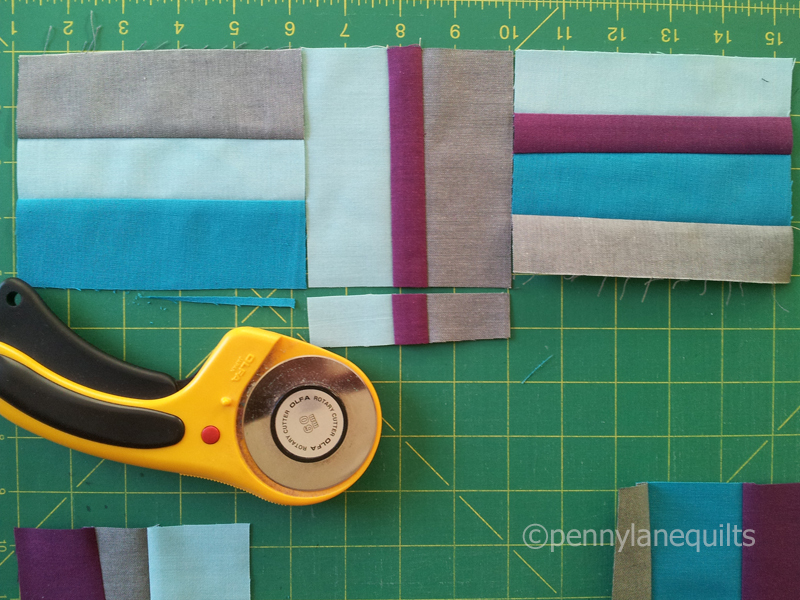 What if I cut the strips wider (or thinner)? What if I used 5 colors? What if I only used 2 colors? What if it was scrappy? What if the units were smaller and I made a 4 x 4 grid? I hope you will give this a try, and that you will enjoy the process as much as I do. If you make a block, I’d love to see it! 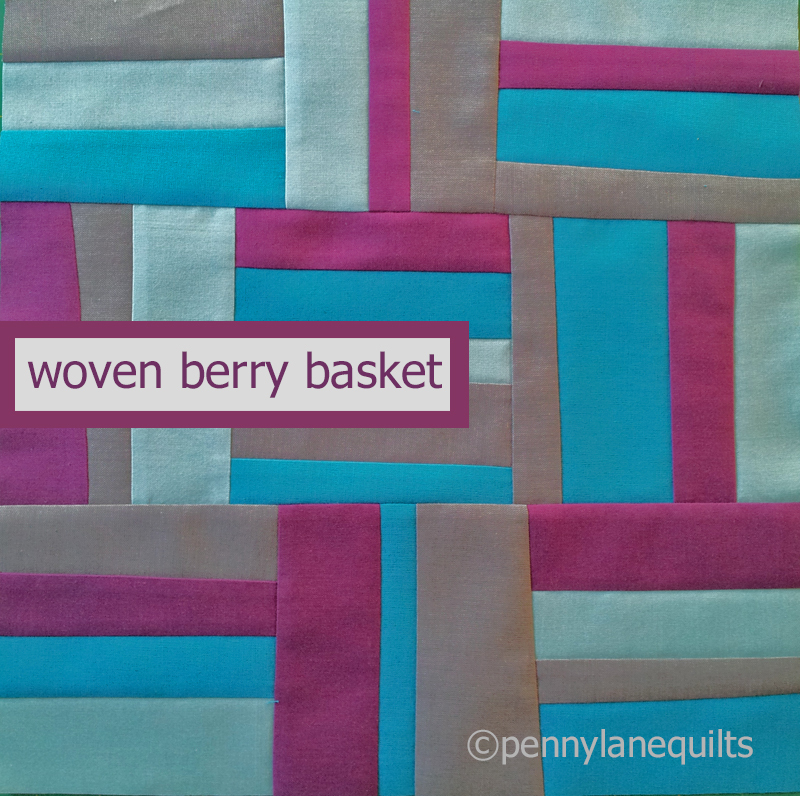 For those on Instagram, tag your photo @pennylanequilts and use the hashtag #wovenberrybasket. Thanks for stopping by! I’d love to hear your thoughts and answer any questions you may have. And don’t forget to enter the Giveaways! 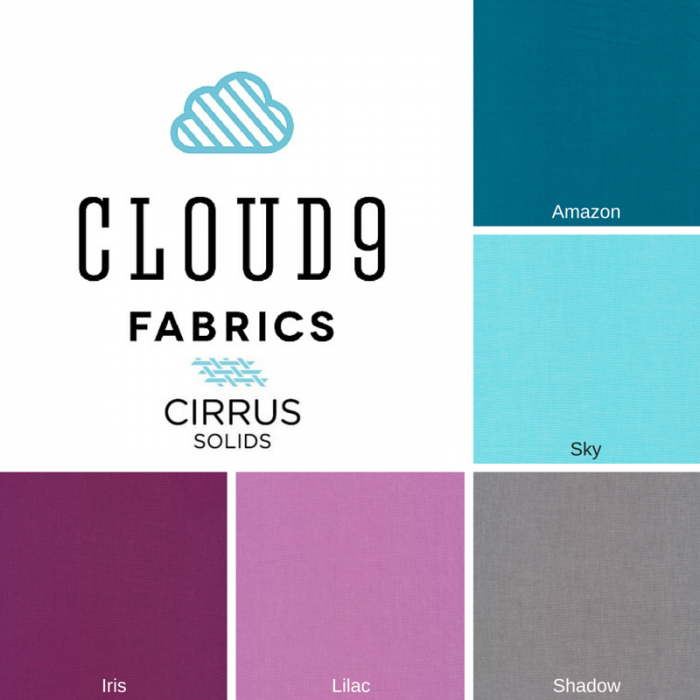 Visit each of our wonderful hosts for the chance to win 3 separate fat quarter bundles of beautiful Cloud9 Cirrus Solids. Be sure to check out the rest of the stops on the hop. You’ll be glad you did!